Little Man has turned 4 (where has the time gone?!). What with Christmas, starting back at nursery and his birthday he has been a very exciting little boy. He loves the Gruffalo so you can imagine, he got quite a few themed presents including a Gruffalo child costume which he insisted on wearing until nursery, only to swap it in time for nursery, for Gruffalo jogging bottoms; a Gruffalo jumper; a Gruffalo top; and Gruffalo hat and mittens. It was quite a sight but if you can’t do it when you are four, when can you do it? 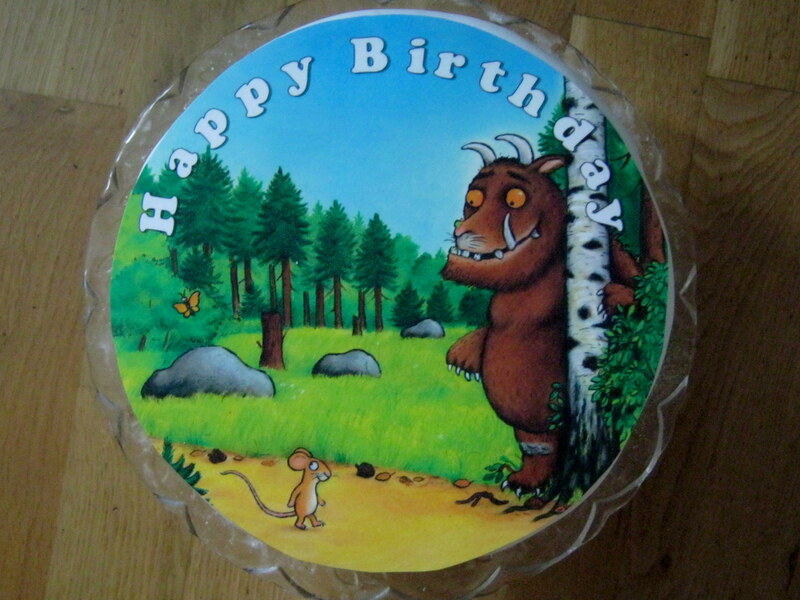 The Gruffalo also made an appearance on his birthday cake. I was pretty pleased with how it turned out in the end, although it was a bit of a nightmare making it! The cake itself was actually really easy to make, but I had a number of ‘drama’s’ on the way. I say drama’s, they weren’t really but they were frustrations. First I couldn’t find one of my tins; then I found the right amounts for the size tin I could find, only to forget to double it. Then I ran out of flour….all this with an excited little boy who want to help make a gruffalo cake with sweets inside. 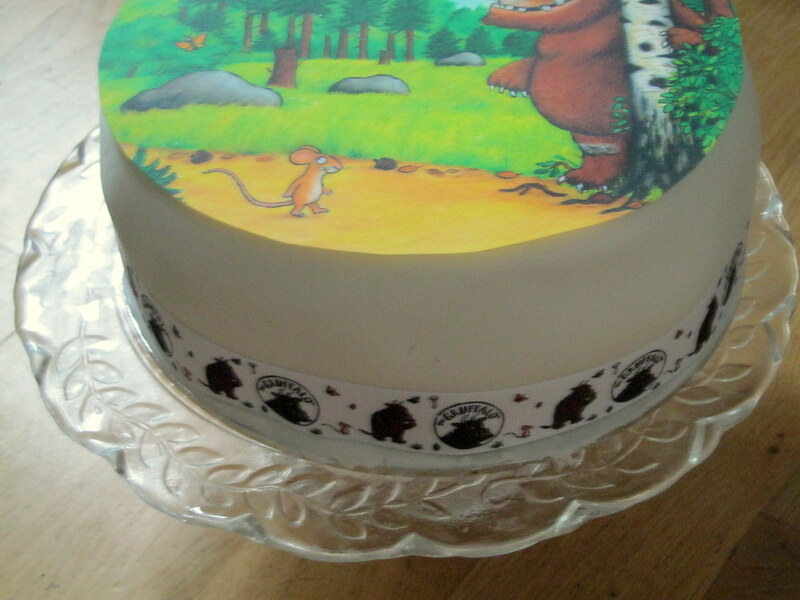 I managed to find a cake shop that sells these edible pictures and the Gruffalo ribbon, made two Madeira Cakes and iced it with fondant icing. I then stuck the picture to the top. See, easy. Ok well not quite that easy as Little Man decided that he wanted secret sweets inside. Saying that it really wasn’t that much harder. If you haven’t made one of these before (and I hadn’t) all you do is cut a disk of sponge out of each cake (I used pastry cutters), not going all the way through to the bottom and in the middle, leaving enough cake around it to give a good portion when cut. Then cut a smaller disk in the middle of one of the disks, going all the way through. This creates a small hole to pour the sweets in so keep the small disk of cake you have just cut out. Using butter icing, sandwich the two cakes together forming a hidden cavity in the middle and the small hole going into it in the top. 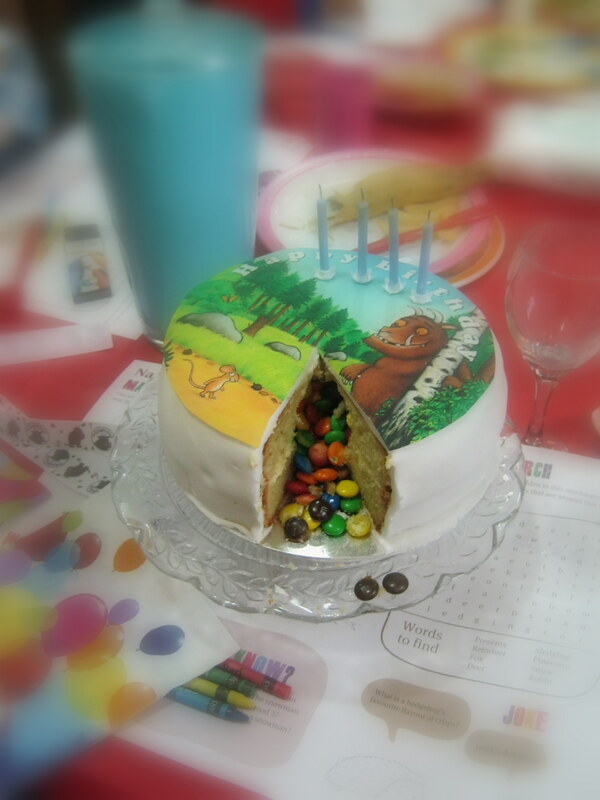 Pour the sweets in (I used M&M’s) and gently push into the gaps. Plug up the hole with the disk of cake you saved the ice it however you have chosen. When you cut into it, make sure the first slice is large enough for the sweets to tumble out through. Little Man, after having fun helping me make it, was very pleased with the end result and I was happy that it turned out ok.